You must immediately stop and back up. Less than ideal conditions are present for driving. You should drive faster to get out of the work zone. Work zone signs are orange and indicate that some type of work is being performed on or alongside the roadway. Be extremely careful when you see these signs. Regulation signs regulate traffic speed and movement, displaying rules which drivers must obey. 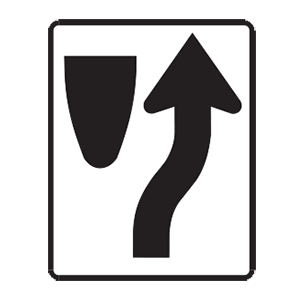 This regulation sign indicates that drivers should keep right to avoid an upcoming potential driving hazard. When parallel parking, your vehicle should be 18 inches from the curb or closer. Always park in a place that is visible to drivers coming from both directions. What is the meaning of the "D" in the SIPDE acronym? Decide on a safe action. The "D" in the SIPDE acronym stands for "Decide on a safe action." Decide on the safest action to take when an unexpected hazard appears. Blow your horn, steer right, and accelerate. Blow your horn, steer left, and brake. Blow your horn, steer right, and brake. Stay in the center of your lane, blow your horn, and brake. If another vehicle is approaching you head-on in your lane, you should first honk your horn to attract attention. If the other driver does not move over, try to escape to the right. If you swerve left and the other driver corrects at the last instant, you will still crash. If a collision is unavoidable, brake firmly and steadily. Every mile per hour you slow down will reduce the impact. Drivers may not pass from either side of a ____ centerline. A double solid yellow line down the center of a two-way road means that it is prohibited for traffic from either direction to cross the center to pass.